Professional artist since 1979. Born in Canada, and now living in Australia since 1984. Traveled extensively throughout Europe 2009 / 2010 and invited to MIRA artist residency Martignano, Italy in June / July 2010 and Ondarte artist residency in Akumal Mexico in 2011. 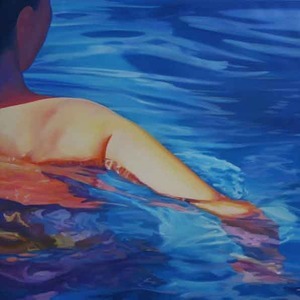 "McEwen's work celebrates the mesmerising visual qualities of water. Her works evoke the shallows of coastal shorelines by breaking down elements of landscape to focus on colour, shape and light.